Here is a closer look at the hilt of Shalamayne as I was assembling it. I used wood to build up the details, although I'd likely use sintra in the future. 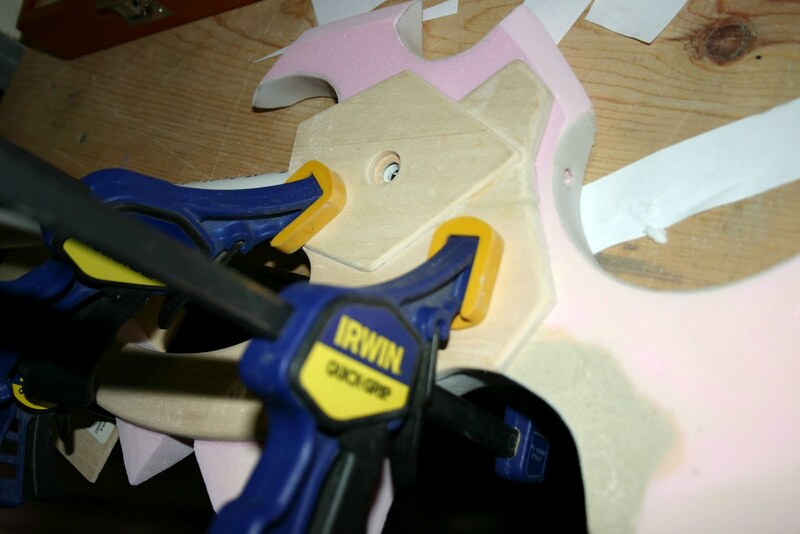 I'm using Wonderflex to reinforce the narrower parts of the foam blade by placing narrow strips within the curves. 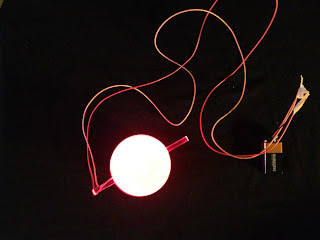 This photo, taken shortly after cutting out the blade from the insulation foam, shows the pvc pipe handle, and the clear acrylic rods that support the floating blade and the red light orb. 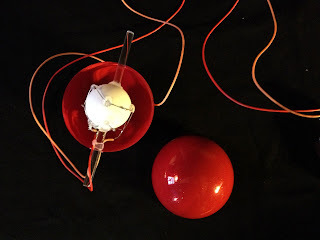 Here is a look inside the plastic ornament I'm using for the "ball of light" in Shalamayne. 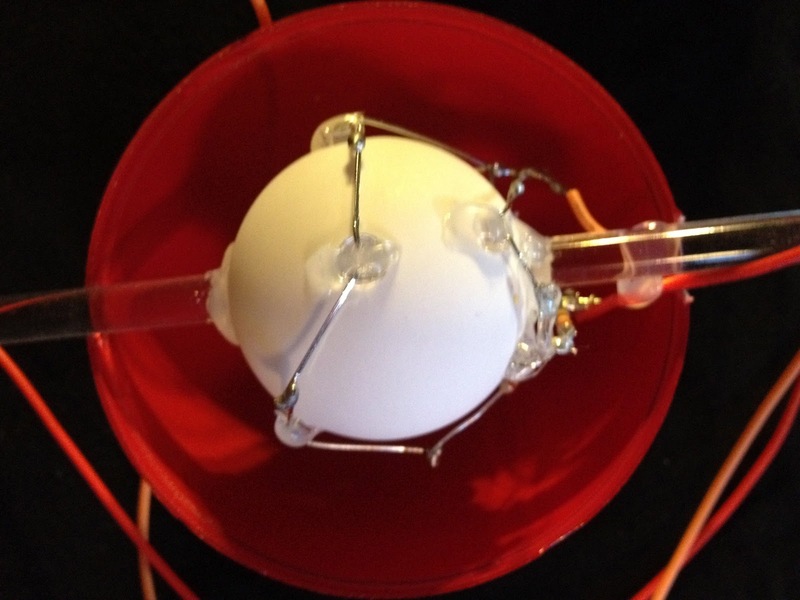 I'm using high intensity red LEDs pointed into a ping pong ball that acts as a diffuser. The ball is held in place by a clear acrylic rod, then I have the plastic ornament over that. The LEDs, wires, resistors and the ping pong ball itself are secured to the rod with hot glue. This lets the orb light up very brightly, without betraying individual LED light sources. As I noted earlier, the wires will run down the sword's handle and I'll add a switch under the pommel that will also control the LEDs behind the red gems in the hilt. The orb's light is visible, even in a well lit room, although a darker room certainly looks better. Unfortunately, taking a picture of a light source doesn't work all that well. 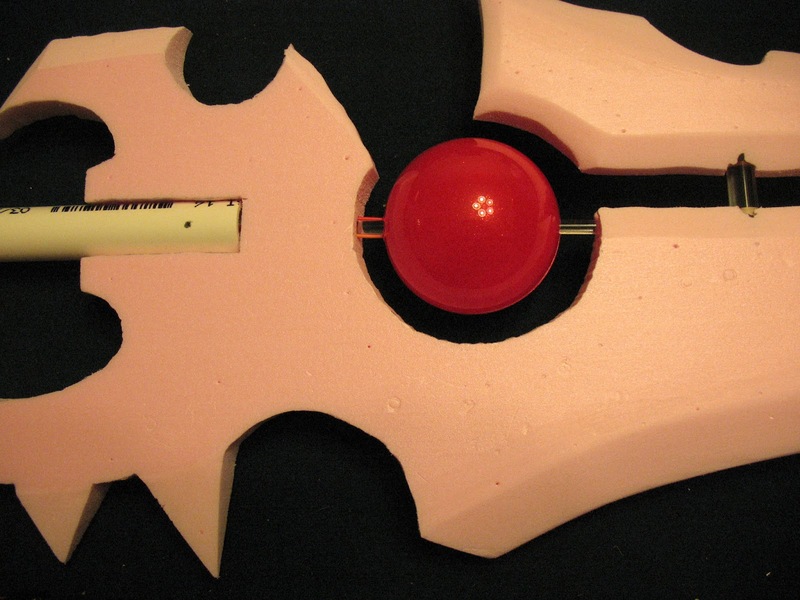 Once the whole sword is assembled, I'll take a few more pictures that will hopefully show off the effect a bit better.